TAG Heuer Connected Modular 41 smartwatch launched with 1GB RAM and Android Wear. Following TAG Heuer Connected Modular 45's launch, TAG Heuer is expanding the collection to include its connected watch with a new 41 mm diameter. This new version of TAG Heuer connected watch offers a smaller and elegant diameter, new colors and performance's improvements. 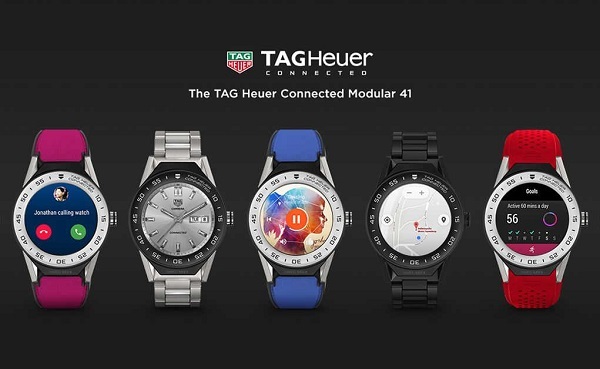 Developed in collaboration with Intel and Google, the TAG Heuer Connected Modular 41 features several improvements made to the 45mm version: its AMOLED 390x390 screen offers 326 ppi resolution and improved brightness - max. 350 nits. Its storage capacity has also been increased to 8 GB, and its RAM memory to 1 GB, making it extremely smooth under any usage conditions. The new model offers all the TAG Heuer Connected Modular 45's functionalities. Water resistant to 50 metres, the watch features GPS, an NFC sensor enabling contactless payment via Android Pay, a very high definition AMOLED screen and numerous customizable TAG Heuer dials from the TAG Heuer Studio. Running on the Android Wear operating system, the TAG Heuer Connected 41 is compatible with Android 4.3 phones and iOS 9 or later versions. TAG Heuer Connected Modular 41's price starts at $1200.